The recent death of Maurice Sendak, author of Where the Wild Things Are, brings some whimsical reflections on the Sacramento-San Joaquin Delta. Several quotes from the book seem to have potential lessons for Delta policy. “Oh, please don’t go—we’ll eat you up—we love you so!” – The Delta devours the things it loves. Subsided islands are devoured by levees failures (e.g., Franks Tract, Mildred Island, and Liberty Island). Delta smelt and juvenile salmon are devoured by un-natural flow patterns from south Delta pumping. Sacramento River inflows also are devoured by south Delta pumping. (Most of the San Joaquin River is devoured upstream of the Delta.) Largemouth bass devour native fishes and are of course devoured by fishermen. And the careers of many lawyers, engineers, administrators, and politicians are profitably, but otherwise futilely, devoured by Delta controversies. “And now,” cried Max, “let the wild rumpus start!”– The wild rumpus of Delta politics and policy has been going on for a long time. But when and how will the rumpus end? BDCP will not be the end, although it might be a new beginning. 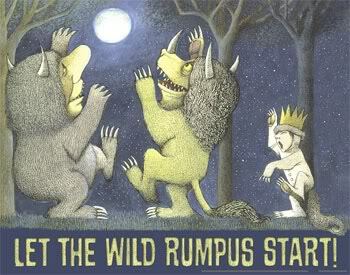 Or the wild rumpus could worsen with the next major earthquake or flood. “And Max, the king of all wild things, was lonely and wanted to be where someone loved him best of all.” – The Delta is a sad place for native species, who often are loved less for themselves than for what they mean for others. The USFWS, our king of wild things through the ESA, desperately needs some love. “And the wild things roared their terrible roars and gnashed their terrible teeth and rolled their terrible eyes and showed their terrible claws.” – A nice description of Delta stakeholders on bad days and many of their press releases. “Then from far away across the world he smelled good things to eat, so he gave up being king of the wild things.” – Wild things and agriculture are commonly perceived to be in conflict. More seriously, outside adults, such as the state and federal governments, are likely needed to end, or at least confine, the wild rumpus of the Delta. The CALFED days of nominal cooperation were fueled by the aroma of relatively abundant state and federal money. But we also seem to need a king of all wild things; without someone to protect them they will disappear. With the more limited ingredients available today, it will be harder for state and federal governments to cook up an appealing alternative to the ongoing rumpus (especially when so many players seem to enjoy giving terrible roars and gnashing terrible teeth). This entry was posted in Uncategorized and tagged Delta, Jay Lund, Sacramento-San Joaquin Delta. Bookmark the permalink.